Pelican 0350 20" Cube Case FREE SHIPPING! 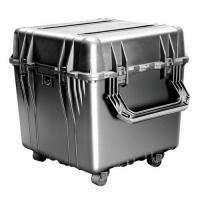 This solidly-built cube case from Pelican is designed to transport your gear in total safety. Its solid, but lightweight walls and stainless steel hardware are durable, crushproof and covered by Pelican's Lifetime Guarantee of Excellence. The interior contains three removable levels of Pick N Pluck™ foam, allowing you to customize padding to intended contents. A corrugated foam sheet embedded in the lid ensures your contents are cushioned from all sides. A full-coverage O-ring seal prevents water and dust from reaching your equipment, while an automatic pressure equalization valve system allows air to pass in and out during flight, preventing a vacuum from forming inside the case. Interior Dimensions (L x W x D): 20" x 20" x 20"
Exterior Dimensions (L x W x D): 22.5" x 22.43" x 21.25"
©2002-2019 CopsPlus.com: Pelican 0350 20" Cube Case FREE SHIPPING!